I was provided the opportunity to field test and review a unique line of barefoot lifestyle shoes made by Kigo Footwear. Now, this recent movement of barefoot footwear has caught on to many and there has also been increasing scientific backing to show the benefits of this type of lifestyle. I finally jumped on the bandwagon and wanted to see what all the hype was about. First the shoes arrived in a small box with no additional fluff. No stuffing paper or other packaging material that gets thrown out anyway. I knew immediately I liked this Eco-Friendly and no-nonsense approach to packaging. When the shoes came out, I cringed when I felt the material. The texture was very similar to the neoprene braces that I had used in the past for an old knee injury (Story for another time). Now, the reason I cringed was because whenever I think of Neoprene, the first thing that comes to mind is TOO SNUG. One thing I absolutely abhor is when a shoe is too snug. I prefer a shoe that has a little give for movement within the shoe. To my delight this was not the case. I proceeded with my examination. The shoes themselves actually exude the look of the minimalist. There are no thick bottom cushions so basically you have a zero to near zero drop on the heels. This helps with overall posture helping in the prevention of additive damage to the back or shoulders over a period of time. The front bumper contours the toe very nicely which gives the shoes a very unique rounded look. This actually piqued the interest of many who happened to glance down. The colors are not too flashy so these could definitely become part of your every day wear. No shoelaces, but instead a quick tightening bungee cord with lock. Wide Toe Housing: Now this feature allows the toes to splay out when making impact on the ground. As for individuals with hobbit feet such as myself the Drive’s became the best fitting pair of shoes I have ever owned. Flexible: The shoes are flexible enough to be rolled up and take up minimal space in the pack. This is extremely ideal for light or ultra light backpackers. It is also perfect for wearing around camp or taking quick breaks on the trek while waiting to air out your boots and dry your socks. The rubber soles have extremely good grip. The shoes did not slip once on any of the smooth surfaces during a rain storm. The shoes took an extremely long time to dry after an hour of use in the rain. 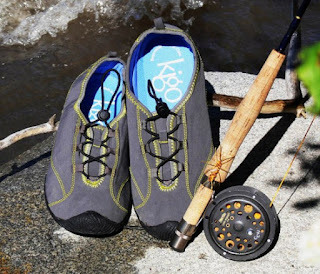 The Kigo Drive are excellent shoes for the outdoors. They are extremely sturdy, roomy, and comfortable. The design meets all the requirements necessary for an avid hiker and for many other activities as well. However, after a few more hiking trips I have come to the conclusion they are not ideal for extended hikes that cover large amounts of distance. The Drives are more fitted towards a casual short expedition, weekend hikes and camp site activities. The shoes may seem to fall slightly on the pricier side for some, but the design, construction, and versatility of the shoe makes this an extremely good deal. Hey JSO. Have you tried the Vibram Five Fingers before? If so, how do they compare against these shoes? Hey Matthew. Thanks for the read. I will actually be posting up a review of a some Vibram's. I will try to remember to add a comparison. Cheers! That was actually a good question. I wasn't too sure myself and checked the Kigo Website. Here is what they said: " How do I clean my kigos? If your kigos get dirty, wipe them with a damp rag or hand wipe. If your kigos get really dirty, clean them in a gentle washer with warm water only. kigo footwear shoes will dry nicely in the sunshine or in a gentle clothes drier. Do not use soap on kigo footwear, as it will compromise future stain and water resistance"